The Vancouver Canucks' 3-1 victory over the Los Angeles Kings in a do-or-die Game Four of their quarterfinal series Wednesday night ensured one thing; they'll be returning home for a Game Five clash Sunday, and that should take place before a screaming, towel-waving horde of fans at Vancouver's Rogers Arena. 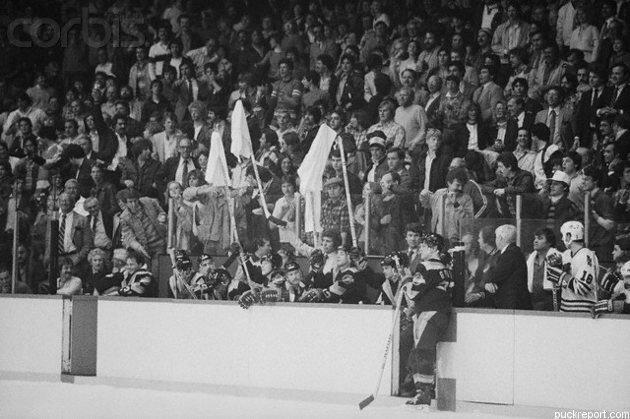 The towels have become a decades-long tradition of Canucks fans, building off an incident in the 1982 playoffs where head coach Roger Neilson (who'd only received that job thanks to a suspension to Harry Neale for going after a fan) raised a white towel on a stick in mock surrender following a disagreeable call and an ensuing power-play goal by Chicago in Game Two of the Western Conference finals. Several players copied him, and although Neilson was ejected, he created a powerful symbol. When the team returned home following their 4-1 loss in that game, they were greeted by a host of towel-waving fans, and those fans helped urge them to three straight wins and a trip to the Stanley Cup final. The lesser-known part of the story is how the towel movement spread so quickly, though, and, as The North Shore Outlook's Len Corben relates, that had a lot to do with a football player, wrestler, bellyflop champion and entrepreneur by the improbable name of Butts Giraud. "This moment of the towel intrigued the three of us," Butts explains in the draft of a book he's slowly putting together about his various escapades. "We sensed an opportunity rising. Mesmerizing events and situations like this are rare indeed. That night, Roger Neilson gave us the foundation for this idea and we were prepared to accept the challenge of making it work. We knew in order to make an immediate impact we had to be creative and move quickly. It's not the great ideas that count; it's acting on them. "I don't think I slept a wink that night as my mind raced back and forth… I started to see what might unfold… This could be the promotion of a lifetime… The ideas started to come fast and furious… We were on to something huge…"
Butts remembers TOWEL POWER being written in big letters on the drawing board at the next morning's staff meeting. "But what could we put on that towel?" he asks rhetorically. "We didn't have time to negotiate the licensing rights to the Canucks logo, so it had to be something generic. They came up with quite the impressive slogan on short notice, "Canucks Take No Survivors." After quickly acquiring 5,000 towels from a local hotel supply company and printing them with the new slogan, Giraud and his partners got the word out through local radio station CKNW, and the results were astonishing. "I met with NW in the early afternoon and by the time Rick Honey went on air, we had more than 1,000 towels in our stores… By 6 pm we were all sold out! "Inside the Pacific Coliseum that night, the stands were a sea of white — 16,413 pumped-up fans, many of them waving white towels, screaming hysterically at the top of their lungs. It was an extraordinary sight to behold. The Canucks weren't the first team to use towels, of course, as the Pittsburgh Steelers' fans came out with their own renowned Terrible Towel in 1975 (inspired by broadcasting and sportswriting legend Myron Cope), and plenty of other teams have since followed suit. 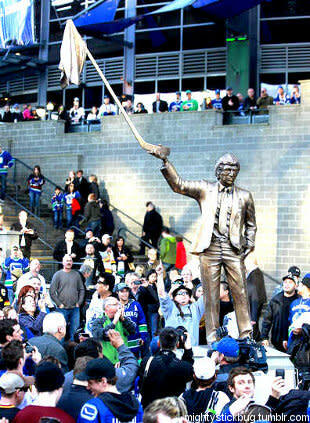 Towel Power's its own unique tradition, though, one that's still going strong and one that was recently honoured with a statue of Neilson and his towel outside Rogers Arena, which you can see at right above. 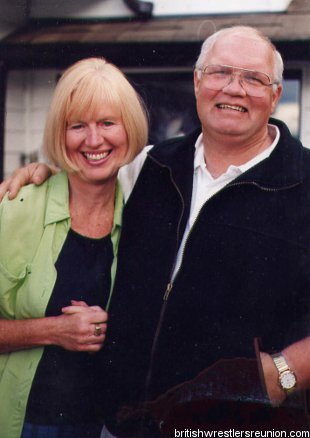 It's a fun NHL tradition, and much of it's thanks to the entrepreneurial spirit of Giraud. We'll see if the towels can inspire the Canucks to glory again Sunday.